Nuns have taken a bad rap from many a contemporary for some examples of excess cited from parochial education. But my experience of those who trained me for Spiritual Direction was a marvel of brilliance, intelligence and compassion. I am particularly indebted to Sr. Carole Riley, Sr. Pelikane, Sr. Molly, and a dear sweet woman who has now gone on to the larger life to be with Jesus. 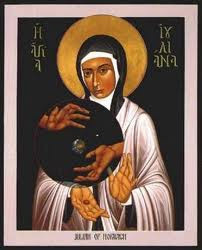 I've read of the lives of Julian of Norwich, Teresa of Avila, Hildegaard of Bingen and find that their spirituality helped pave the way for current understandings of critical importance for Spiritual Direction in our present day. I awoke last night to words dancing in my heart of these wonderful women. I thought of my dear grandmother, and then too my wife with whom I am reunited today after months of separation. She has been tending to my son after he suffered a stroke. And then I awoke to a stream of words which I hurriedly wrote down. And we were enfolded by Our Lady’s embrace. As a woman would her knitting. O the stories she can tell! But she beat me to that too by doing more and better for everyone else. She is Something Beautiful for God!